Traveling Tech Guy Blog: What's the Time? 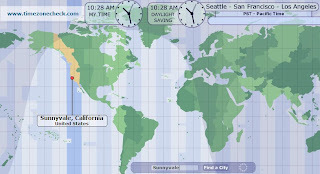 Just "stumbled upon" around, and reached this amazing site: Time Zone Check. A beautiful flash interface allows you to find the time anywhere around the world, either graphically, or by searching for a city name (for the geographically-challenged :)). The site that served me well so far (especially on transatlantic conference calls, when you don't know whether it's "good morning", "good evening", or "sorry that I woke you up" on the other side) is The World Clock, showing date and time at major cities.